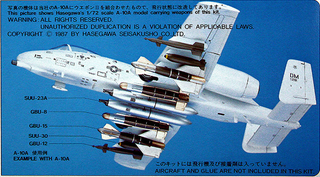 A post on the FP reminded me of this pic from Hasegawa’s Weapons Set: II, which included guided bombs, SUUs and laser designators. Yes, that is an A-10 with two SUU-23 20mm gun pods, which were normally carried singly by F-4s. This was just to show off the weapons included in the kit, as I don’t think a Warthog could get airborne with a load like that, nor could it actually carry the GBU-8 or -15. Still, BBBBBBRRRRRRRRRRRRRRRTTTTTTTTTT with a side of bbbbbbbbbbrrrrrrrrrrrrrrrtttttttttttttt.